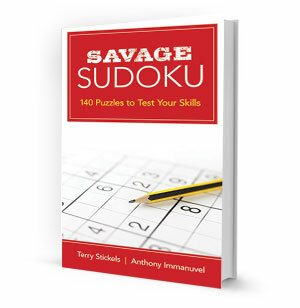 Sudoku enthusiasts, rejoice! Here's a collection that features scores of engrossing puzzles that promise to truly test your skills. Created by Terry Stickels, a nationally syndicated puzzle maker, the challenges range in difficulty from medium and hard to very hard and extremely difficult. Don't worry if you're truly stumped, complete solutions appear at the end of the book.